Mt. Horeb Summer Frolic - The Kickoff to Summer! Mr. Ed’s Magical Midways, LLC, of North Freedom, Wis., will provide rides, games and food stands for the Frolic carnival. Thursday, June 7, 2018 – rides open 5–10 p.m. There will be a wristband deal of $20. Tickets may also be used. Friday, June 8, 2018 – rides open 5–10 p.m. Tickets are available for purchase on site (see below for pricing and information), and pre-sale ride tickets will be accepted. There are no wristband deals on Friday night. 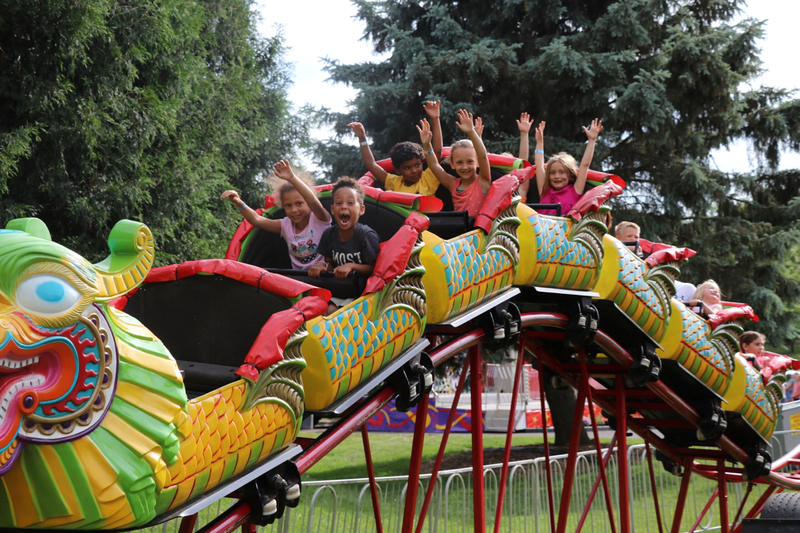 Saturday, June 10, 2018 – rides open from noon–10 p.m. There will be a wristband deal of $20 from noon–5 p.m. Tickets may also be used. Sunday, June 11, 2018 – rides open from noon–5 p.m. Tickets are available for purchase on site (see below for pricing & information), and pre-sale ride tickets will be accepted. There are no wristband deals on Sunday. Rides require two or more regular tickets. Pre-sale discounted ride tickets are valid any day of the festival. They are sold in packs of five rides for $10. Unlike the tickets on sale in the booths at the carnival, just one of these tickets is good for a ride. Tickets may be purchased from approximately two weeks before the festival through noon the day the festival begins at Miller & Sons Supermarket and Old National Bank in Mount Horeb. NOTE: All rides have special height and size requirements. Visit Mr. Ed’s Rides page for information. Wristbands are not valid on the Scooter (bumper cars) or Gravity Storm (bungee jumping).